For an added benefit to our liposuction patients, Teleos Plastic Surgery is proud to offer Endermologie®. This advanced procedure is the first non-invasive treatment to be FDA-approved for improving the “orange peel” look of cellulite on your body. 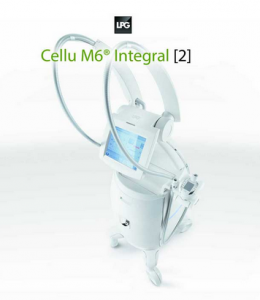 Through a mechano-stimulation technique of suction and rolling, the brand new LPG Cellu-M6 Integral is the latest in Endermologie®. The suction and rolling actions help to relax “septa” in the skin that are causing signs of cellulite. Septa are like walls around the fat in the body. When we manipulate the cellulite “walls,” the skin tone improves, the appearance of cellulite improves, and some of the stored fat is removed. Stimulation of the body via Endermologie® helps to increase collagen and elastin production, which helps to tighten, tone, and smooth the skin. It is approximately a 35-minute treatment. We encourage all of our liposuction patients to receive a minimum of two treatments before surgery and at least two treatments after surgery. These treatments can help with lymphatic drainage, reduce bruising and swelling from your procedure, and help smooth lumps and bumps. Please call us 888.963.7629 or contact us via e-mail for a consultation to see if Endermologie® is right for you or to be sure that you include Endermologie® treatments with your liposuction procedure for optimal results.